Do you need help with any of the community connection topics below, including membership, goverance, meetings, or community mail lists? Request Support for any of the specific community connection services listed below. A project manager will be assigned for complex requests that require multiple services, coordination, and management. 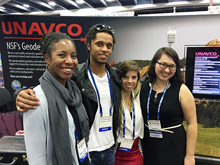 Membership — Apply to become a UNAVCO member. Or do you have a question about membership? Goverance — Do you have a question or concern about UNAVCO governance? Meetings and Workshops — Do you have an idea for a meeting or workshop of interest to the geodetic community? A question about an upcoming meeting or workshop? Community Mail Lists — Do you have an email that should go out to the UNAVCO community but you are uncertain which community email list to use? Email community unavco.org for quick questions or if you cannot find what you need in our Community section.